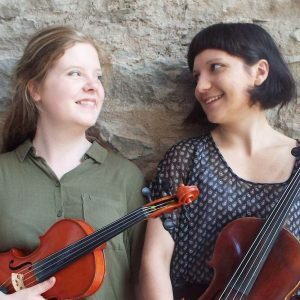 Joanna Stark and Elisabeth Flett first started playing together in 2008 as part of folk trio Three’s A Crowd (Cambridge Folk Festival 2013 Youth Hub Band Artists) and have performed across the UK ever since. Notable performances include Eden Festival 2016, Edinburgh Fringe 2018, Solas 2018, Dunfermline Folk Club, Wighton Centre, Two Sisters Cafe, Verdant Works, Bone Deep Book Launch at Hospitalfield House and competing as Semi-Finalists in the BBC Radio 2 Young Folk Awards 2017. Their innovative blend of different musical styles and sparky live performances makes Shamblestone an unusual and exciting duo.